A candid, fun moment between the bride and the groom. 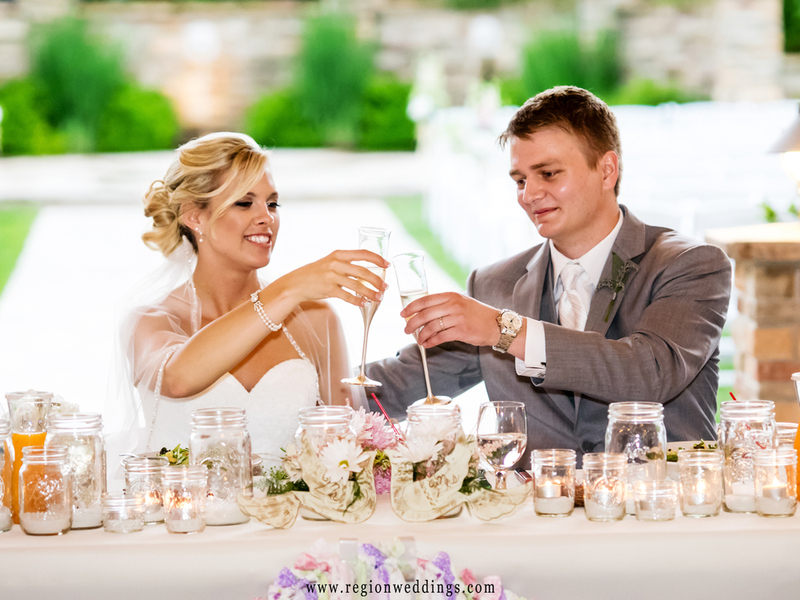 Lindsey and Ryan had a wonderful June wedding at Sandy Pines Pavilion in Demotte, Indiana. They were surrounded by friends and family that gave us many warm and tender and fun moments to capture. It rained this day and brought their outdoor ceremony inside the pavilion. Let's just get that out of the way. So what, I say. It certainly didn't dampen the couple's spirit as I captured them laughing and having fun all day long. As Ryan says in his note to Lindsey that she received while getting ready "nothing is more important to me than making sure you know how much I love you". Groom's love letter to his bride. The girls got ready in the spacious Sandy Pines Condominiums a block or so away from the pavilion. I captured hair and make up as well as the wonderful dress Lindsey's was going to be wearing soon. My Big Fat Greek Wedding played on the TV as we occasionally checked weather reports. A beautiful wedding dress hangs from a chandelier at Sandy Pines Condo. I went around the condo area as well as the golf course itself with the girls as my second photographer captured the guys at another location. Portrait of the bride at the Sandy Pines Condo in Demotte. Bridesmaids do some tree hugging at Sandy Pines Golf Course. As guests entered the grounds they were greeted by the wonderfully rustic homemade signs announcing the couple's big day. The entire event was a family affair all the way with lots of kids, grandparents and more. Ryan's brothers helped rescue some of the ceremony decor as everything moved inside with the thunderstorm brewing. The bride high fives a little baby boy at her wedding. Although the rain was coming down quite heavy at this point, everything was all smiles as Ryan and Lindsey were married. Wedding ceremony at Sandy Pines Pavilion. The proud mother of the groom. Getting married at Sandy Pines. We immidiately took family pictures as the rain continued and when it let up we took couple's shots along the pathways on the golf course. The rain gave us some nicely saturated greenery and a dramatic sky. The newly married couple walk along the Sandy Pines Golf Course in Demotte, Indiana. The bride and groom flirt in this candid wedding photo. A dramatic sky wedding photo at Sandy Pines Golf Course in Demotte, Indiana. The bride and groom drink champagne at Sandy Pines Pavilion during their wedding reception. First dance at Sandy Pines. I always say to embrace the rain at your wedding. Once nightfall hit and it became apparent that things were not going to let up, I asked Lindsey if she minded taking a walk along the puddled path of the pavilion in her dress. She was up for it so i provided them with a clear umbrella and we took a series of night wedding photos in the rain. I'm so glad we did this as it's going to very unique wedding pictures for their album. 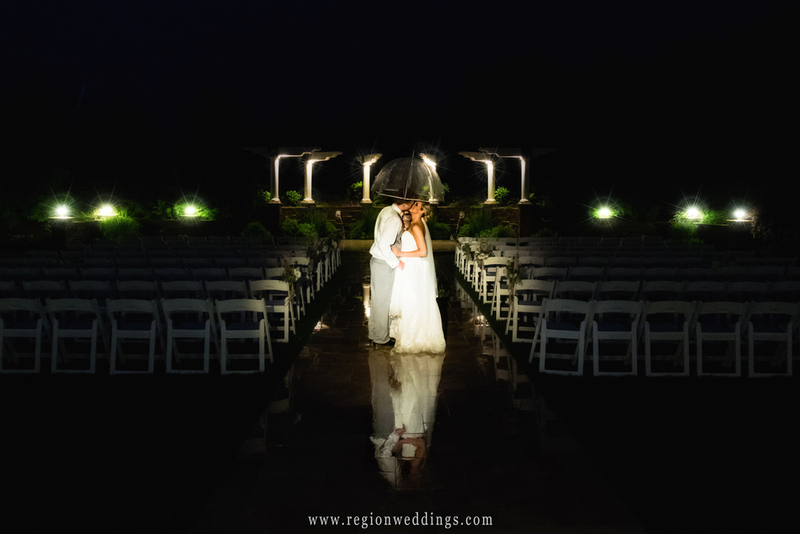 Night time wedding photo in the rain. I hope you have enjoyed this sneak peek look at Ryan and Lindsey's June wedding at Sandy Pines Pavilion in Demotte, Indiana. Many more to come. Please subscribe here below and visit the Region Weddings Facebook page too.